There's the front bedroom, note the intact plaster corbels. And the front parlour. The photos are a little sketchy because it's so dark and there is no lighting in any of the rooms yet. 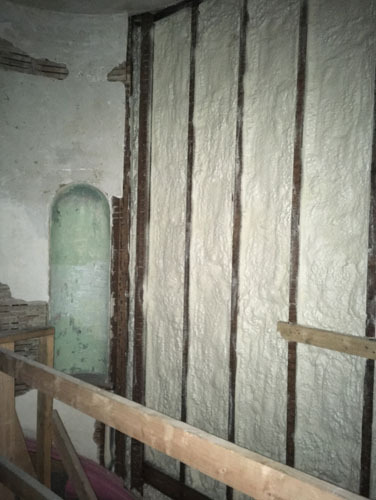 You can see that they stopped the insulation at the inside walls, so the curve of the stairway is still (partly) preserved. The house feels very quiet now, and all those odd little drafts we used to get through the space are just gone. Between the ongoing roof installation (it has been raining down buckets so the process has taken longer than would be ideal) and this, we are due to get drywall starting next week. And at this point in the process, tile has started to show up on site, which makes it all very real. 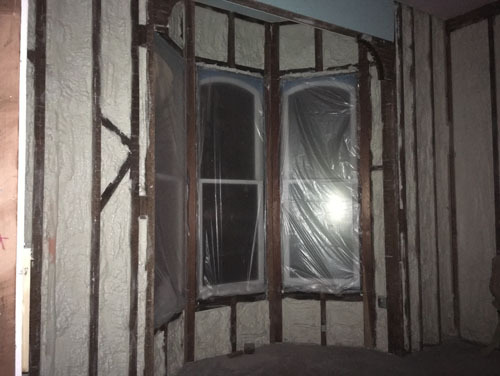 What are the few angled pieces of wood in the insulated walls? I presume that's closed cell polyurethane foam? I just had some of that installed the other day, it's fantastic stuff! Yes, closed cell foam. It's very nice, and we don't have to worry about water in the walls at all. The diagonal pieces are cross-bracing. The concept behind it has been refined quite a bit since the house was built, and in this configuration it doesn't really do much, but that's transitional framing for you. They were still figuring things out. 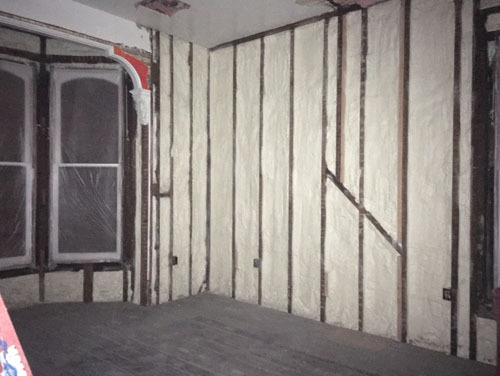 Apparently fire departments around the world are putting out warnings that foam insulation will kill you in case of a fire - once the foam combusts it gets REALLY toxic. On the other hand most houses are full of materials that will get you first and that are more likely to catch fire because they aren't inside walls. Yeah, when insulation is closed inside a wall it is significantly less dangerous. Add in sprinklers and it's not a huge concern. Once the inside of the walls is on fire all inhabitants should be well out of the house.